Last night GQ hosted its 20th annual Man of the Year Awards in association with Hugo Boss at the Tate Modern in London, and as expected, it was a display of impeccable suits (see Jared Leto in his full Gucci glory). But it wasn't just the boys who leaned on tuxedos, as it seemed like the girls were just as keen to play with suiting. Including myself, as a night celebrating menswear seemed like the perfect time for me to wear a dress suit for the first time. Tailoring is a key trend for A/W 17, and it's likely to be the winning party dressing option for girls who don't do sequins in three months' time. Keep scrolling the three key ways to do evening tailoring for black tie events. Style Notes: I decided to keep it classic, opting for a Hugo Boss black jacket with a fitted waist and cigarette trousers falling to the ankle. I quickly discovered the key to wearing a suit like this is to make sure it fits perfectly, and so it pays to alter the jacket, especially the shoulders. You want the emphasis to be on the suit, so stick to a discreet black camisole underneath, but when it comes to the shoes, there are no rules. Enter, the feathered mules. 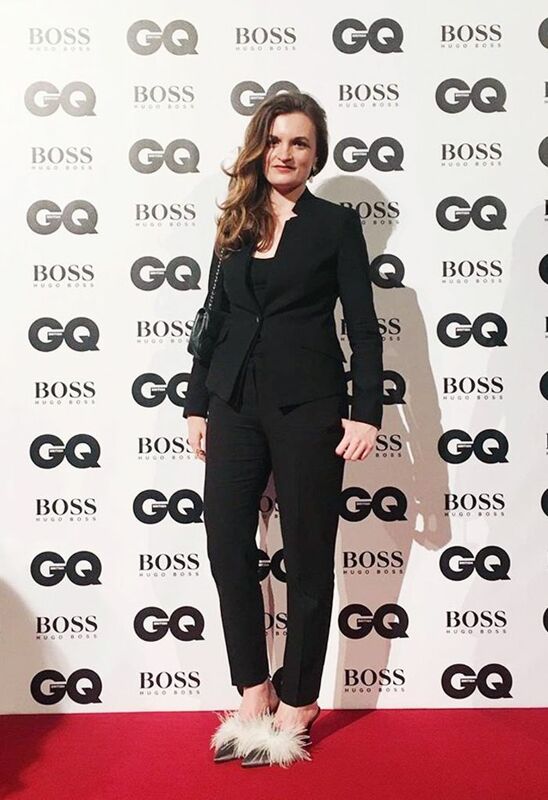 Style Notes: Tess Ward, food blogger and writer, went on the other end of the suiting scale and wore a Hugo Boss checked jacket with matching slim-leg trousers. Once again, the trouser leg was slightly cropped—a flattering length for eveningwear. She kept the rest simple, wearing nothing underneath the suit jacket, adding a pair of glossy black ankle-strap stilettos and pulling her hair back. Follow our Instagram stories to see Tess's takeover from the ceremony. Style Notes: For an updated twist on the look, follow Camille Charrière's lead, and opt for a tailored tuxedo-inspired jumpsuit. Camille shows that like the classic tuxedo, the key here is to play with accessories, adding statement Roger Vivier heels, artsy earrings and a bold red lip. Next up, see our edit of the best party dresses to buy now.